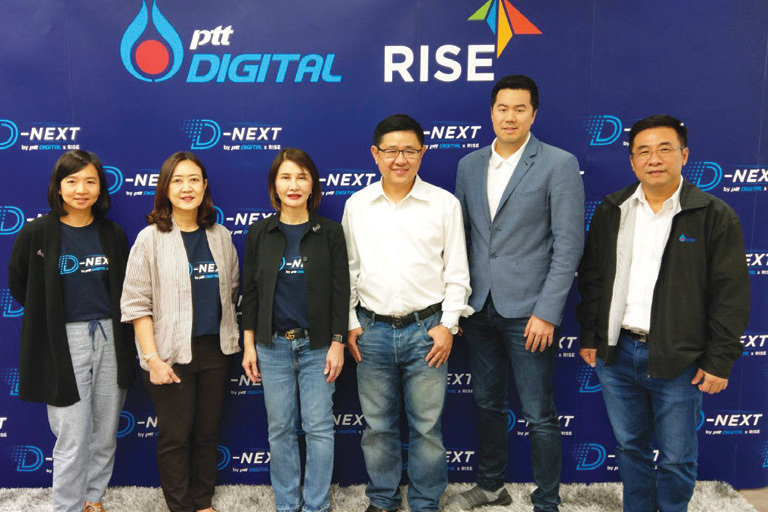 Recently, PTT Group, represented by PTT Digital Solutions Company Limited, has collaborated with RISE, an expert in startups and the fi rst corporate accelerator in Thailand, to introduce a brand-new growth accelerator program known as ‘D-NEXT by PTT Digital x RISE’, with the debut of 15 most innovative startup teams from seven countries, including USA, Philippines, Vietnam, Malaysia, South Korea, Singapore, and Thailand. The selected startup teams are invited to join the Bootcamp, a well-supervised startup training program, for a period of three months. The purpose of this project are a great opportunity to be part of PTT Group’s Digital Transformation program and startups will also be encouraged to scale their business in Thailand by leveraging from all the corporate networks which RISE will be providing.